Black Maxi Skirt worn as tube dress - ? I think I am over na with my whole 50s craze. Ang sad, haha. Right now, I am back with the whole luwagluwagan look...As Pax described my style, "Gothic Boho" (haha). And although I did a rather quick return to lousy blouses and maxi skirts, I realized that I do have current obsessions, mainly summer 2012's evident trends: neons and pastels! Oh how I love the fluorescent/ highlighter colors, and my heart just beats when I see mint or milky toned things! Parang yung milk pen na nauso nung high school, pero kairita kasi hindi mo mabasa, haha. I love those colors! Lakas maka-papayat ng two-tone top noh? Wore this really comfortable outfit on a Bloggers United meeting in Fort earlier today with Pax. The statement half black-half orange top was actually her gift, and Sarah's, when they had me waiting in an event and I did a "walk out drama", haha (suhol!). I love these girls like real kabarkada, but no wag lang nila mabasa ito at baka magsilakihan ang ulo! LOL! Halos lahat niyan order ni Pax haha! My yummy Vegetarian Pad Thai from My Thai! Ang laki ng serving for just P200! Parang ang tagal naming di na nagkita! :D Talkies galore! Happy birthday SOS!!! School of Satchel celebrates its first year! 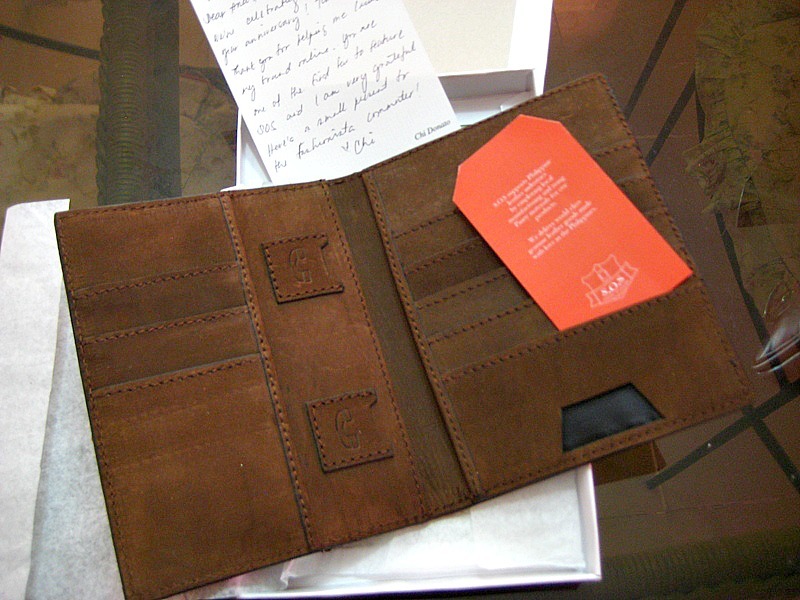 They sent a cool leather passport holder for supporting SOS through its kickoff year, congrats Bianca!!!! I love the old school cool feel! Excited? Haha! Using it na! New summer trinkets from SM Accessories: Oval Turquoise Necklace, Gold and Blush Necklace, and Mint Shades! Department store finds: Stars and Polka garments, Cat's Eye and MRT Card-print Shades, and THE DENIM SHORTS I WAS LOOKING FOR SINCE FOREVER (from F21)! Look at the print of this wayfarer: Parang MRT card! Panindigan na ang pagiging Fashionista Commuter! Haha! Have a blessed week Ana!